Greetings All ! 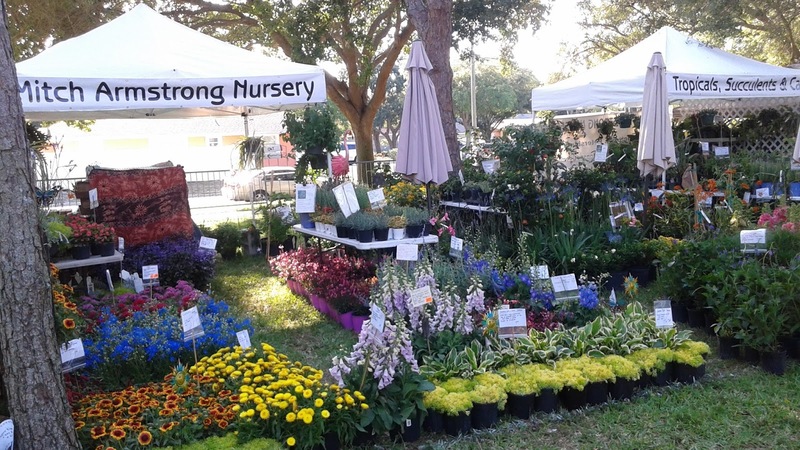 Well, as most of you know, we had the big Green Thumb Festival last weekend here in St. Pete and it was a great success with the biggest crowds ever. In fact, I know for some, it was Tooooo crowded so we thank everyone for hanging in there with patience and support. We had 12 people working our booth - 7 sellers, a banker, a plant holding area manager, a plant re-stocker, and Mitch & I overseeing it all ! It was a very successful show overall for the 120 plus vendors, and the City of St. Pete Parks Dept. did a great job of organizing and running the event. Mark your calendars for 2019 when Green Thumb Festival will happen again the last weekend of April. At this time of year after our last big Spring show at Green Thumb, some of our larder is empty so to speak.....Crops are done now for Hollyhocks, Digitalis and a lot of perennials and they will not be available by us until the Fall. But, going forward, we still do have some great things coming up that were just too small to bring to the show. Examples are Passion Vine, Giant Milkweed, the very popular Abutilon (Chinese lantern) Hibiscus and dwarf Papyrus - stay tuned to our blog for when they will be ready ! We were able to obtain some beautiful deco pot containers full of them, and this week they are in Pink. They do come in Lavenders and Reds too and we are looking forward to seeing those. As with any Vinca, it's a great container plant, or planted in-ground, super drought tolerant once established and relatively pest free. Typically blooming from early Spring to late Fall (and further on if we have another warm winter), we think this is going to be a real winner this year ! 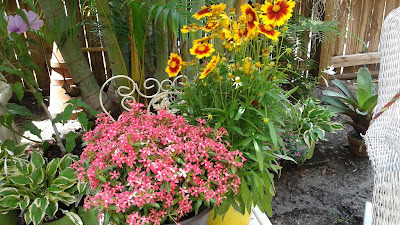 Pictured above with the Vinca is Coreopsis (aka Tickweed), which has a super large flower with intense red and yellow flowers. Again, loving sun, drought tolerant and a hardy perennial here. 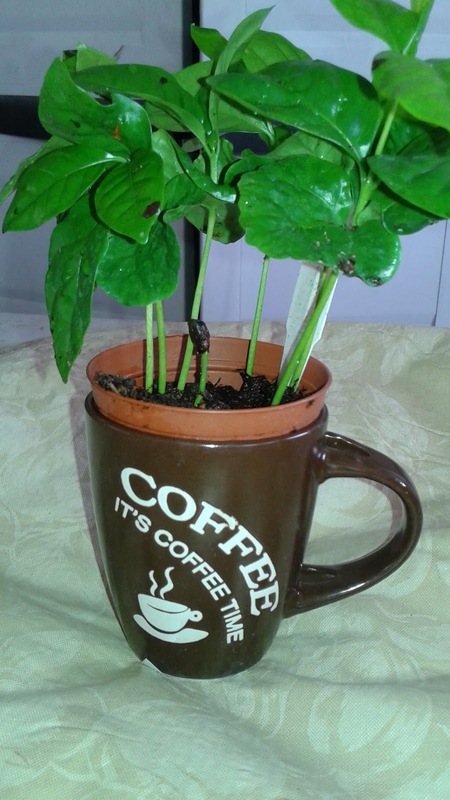 If your Mom is a coffee drinker, she will get a kick out of this ! And even though it is tiny (the plant is in a 3 inch pot that fits inside the mug), it is already producing coffee beans - wow. Our Low-light selection includes Calatheas, Ferns, Anthuriums, Curly Spiders, Mottled Philodendron and even some lovely African Violets. Of course, we are complete restocked up with hundreds of fresh Mini Succulents and Cacti that Mitch and I hand pick every week from our growers network. As the regular season of Saturday Morning Market, downtown St. Pete winds down at the end of May, we will then move to the lovely shaded Oak Trees of Williams Park, just 2 blocks away for Summer Market from June through the end of August, so you can continue to get your fresh Produce, wonderful Plants, works from talented Artisans and specialty foods galore. Hope to see you around Market ! Hello there! Will you have any Butterfly Wing plants (Christia obcordata) for sale this Saturday?